How Many People Abuse Methylphenidate? Methlyphenidate, also known as Ritalin or Concerta, is a stimulant medication used to treat ADHD, depression, narcolepsy and a variety of other medical and mental health conditions. Many people abuse the drug to boost performance, get high or lose weight. Abuse of the drug can lead to a number of side effectssuch as anxiety, irritability, depression, shortness of breath, chest pain, high blood pressure and vomiting. Over the long term, people who abuse the drug may experience depression, insomnia, muscle aches, body temperature fluctuations and trouble with work or school. Call to speak with a treatment support specialist about rehabilitation options in your area. 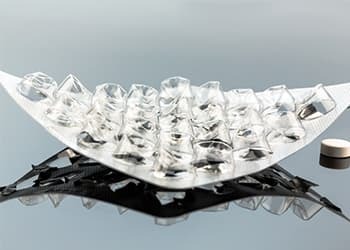 Methlyphenidate, also known as Ritalin or Concerta (brand names for the drug), is a stimulant medication that is prescribed to treat attention deficit hyperactivity disorder (ADHD) and narcolepsy. If taken according to prescription, the drug causes a gradual increase in dopamine, a neurotransmitter that plays a role in movement, attention and the pleasure/reward region of the brain. It also leads to a reduction of impulsive behavior, which helps individuals with ADHD remain focused and attentive. The misuse of methylphenidate can result in a more rapid increase of dopamine activity. It can lead to a feeling of euphoria, which can cause someone to develop an addiction. It is important to follow your doctor’s instructions very carefullyC when taking Ritalin to avoid misuse, potential tolerance and subsequent dependence. Methylphenidate abuse can escalate to an addiction that can take over your life. If this has happened to you or someone you love, you have several options for getting treatment and putting your life back on track. Outpatient recovery centers enable you to live at home and visit a rehab center during the week. Types of outpatient include intensive outpatient, partial hospitalization and therapy and counseling. Inpatient or residential recovery centers provide a more intense level of care than outpatient. You live at the rehabilitation facility for the course of your treatment and engage in group and individual therapy to work through your addiction and develop coping skills. These programs often begin with a detoxification process. 12-step programs such as Alcoholics Anonymous help you recover through a process of admitting your helplessness over your addiction and working through the 12-step program. Whether you have insurance and what it will cover. How long you want to spend in treatment. What kind of treatment (inpatient vs. outpatient) you feel more comfortable with. Where you want to go for rehab (stay close to home or travel). What kind of features you want in a program. To find out more about insurance coverage, call one of the numbers below. You can also look into ways to finance your treatment. To find out more about rehab options your insurance will cover, call 1-888-319-2606 Who Answers? to speak with a trained treatment support representative. To find rehab centers that cater to people without insurance, contact the Substance Abuse and Mental Health Services Administration’s toll-free helpline. The pills are often crushed and snorted or injected. A person may take several pills at once to get high. People may also misuse it to enhance energy, focus, performance and weight loss because it can suppress appetite.1, 2 Many high school and college students misuse it for its stimulating effects. The pills are often crushed and snorted. Some people also mix it with water and inject it directly into a vein.1 Injecting or snorting methylphenidate greatly increases the risk of addiction. Serious health consequences such as blocked blood vessels can also occur if the powder does not completely dissolve before it is injected into the body. If immediate-release pills are consumed, the effects will persist for 4 to 6 hours, or 3 to 9 hours for sustained-release pills. Sustained release formulations are sometimes crushed by those abusing the drug to bypass the time-release safeguard. 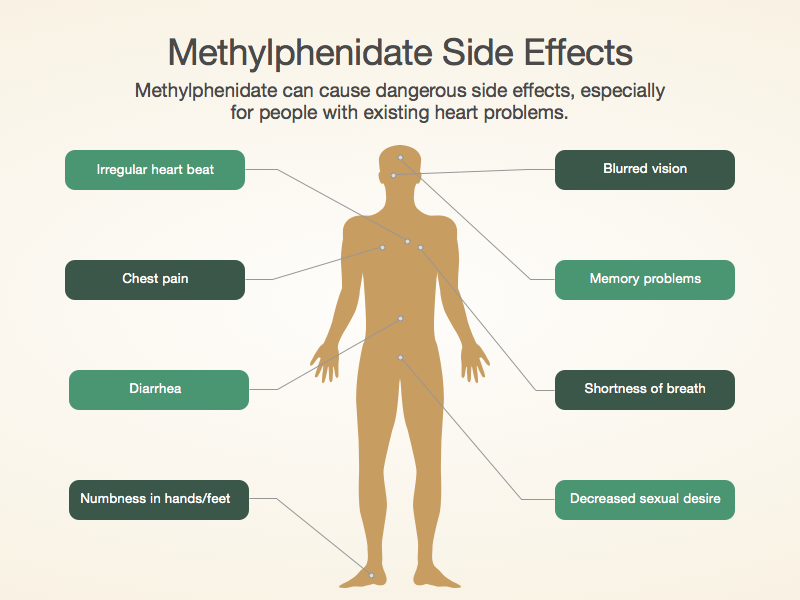 Methylphenidate can cause sudden death in adults and children alike, especially those with pre-existing cardiac issues including myocardial defects, valvular disease or arrhythmias. Inform your doctor of any health conditions you have and ask about any risks associated with taking the medication. Numbing or tingling in hands or feet. A rapid or irregular heartbeat. Priapism or painful, persistent erection. Weight changes (e.g., excessive weight loss). Financial troubles due to drug-seeking behavior. Marital, familial and personal relationship problems. In addition, individuals who are prescribed this medication may begin to use it as a substitute for cocaine or crack because it has similar effects.7 Snorting or injecting large doses of this drug creates a sudden burst of energy due to the rapid increase of dopamine. The feeling of quickly getting high may cause individuals to want more and more of the drug, which leads to an addiction. People who take methylphenidate to stay awake or to boost performance also become more motivated to continue taking this drug to preserve or prolong these effects. Taking more methylphenidate than intended or over a longer period of time. Persistent failure to quit or cut down on drug use. Spending an excessive amount of time obtaining methylphenidate, using it and recovering from it. Strong cravings to use the drug. Repeated use despite negative consequences at work, school or home. Repeated use despite social and interpersonal problems worsened by methylphenidate abuse. Abandoning pleasurable activities and hobbies for methylphenidate use. Repeated use in physically dangerous situations such as driving or operating machinery. Continued methylphenidate use regardless of a physical or psychological problem caused or aggravated by drug use. Needing more of the drug to get the same desired effect. Experiencing fewer effects when taking the same amount of the drug. Experiencing withdrawal symptoms specific to methylphenidate. Taking methylphenidate to avoid or relieve symptoms. Approximately 1.6 million people aged 12 or older were current nonmedical users of stimulants in 2014, including methylphenidate. than the percentages for most years between 2005 and 2012. Stimulant abuse can lead to dangerously high body temperature, blood pressure and heartbeat.6, 7 All of these symptoms may result in hallucinations and paranoia or even brain and heart damage. If you observe or experience any of the following symptoms, call 911 or visit an emergency room immediately. A very rapid and irregular heart beat. Swelling of the face, lips, tongue, throat or face. Seizures, which may lead to a coma. Combining methylphenidate with alcohol increases the risk of alcohol poisoning. Methylphenidate is prescribed to about 2.4 million teenagers a year. This greatly increases the chances that teens will begin to abuse and become addicted to this drug. Most teenagers who are prescribed this drug have ADHD. But if they begin to experiment with different doses or methods of taking it (e.g., snorting, injection), it can precipitate a compulsive cycle of misuse and addiction. Staying awake late at night. Sudden loss of appetite and weight loss. Lots of young people get their hands on ADHD medications without a prescription. But where do they get them? 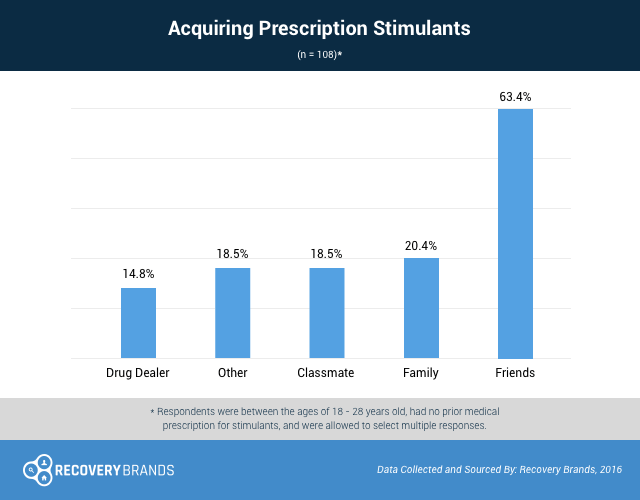 Recovery Brands found that in 2016, 63% of young adults between the ages of 18 and 28 acquired prescription stimulants through friends. More than 20% got them via family members, 18.5% from people they knew from school, and 14.8% from a drug dealer. People with a prescription should monitor their ADHD medications to protect young adults from abuse and addiction. To get help with methylphenidate abuse, call 1-888-319-2606 Who Answers? to speak with a treatment support specialist about recovery options.
. Fox AM, Rieder MJ. (1993). Risks and benefits of drugs used in the management of the hyperactive child. Drug Saf. 9(1):38-50.
. Volkow ND, Wang GJ, Gatley SJ, Fowler JS, Ding YS, Logan J, Hitzemann R, Angrist B, Lieberman J. (1996). Temporal relationships between the pharmacokinetics of methylphenidate in the human brain and its behavioral and cardiovascular effects. Psychopharmacology (Berl). 123(1):26-33.
. Konrad K, Neufang S, Fink GR, Herpertz-Dahlmann B. (2007). Long-term effects of methylphenidate on neural networks associated with executive attention in children with ADHD: results from a longitudinal functional MRI study. J Am Acad Child Adolesc Psychiatry 46(12):1633-41.
. Gahr M, Kolle MA. (2014). Methylphenidate intoxication: somnolence as an uncommon clinical symptom and proof of overdosing by increased serum levels of ritalinic acid. Pharmacopsychiatry 47(6):215-8.
. American Psychiatric Association. (2013). Diagnostic and statistical manual of mental disorders: DSM-5. (5th ed.) Washington, D.C.